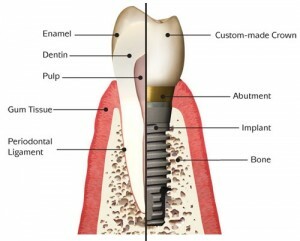 Thinking of getting dental implants in Buffalo, NY? The following guide lists the top 10 dental clinics as well as what you can expect to pay for a dental implant in Buffalo. Click on the profile of a dentist near you to read more about them. We are one of the very few offices with CEREC crowns – the ability to make a permanent crown in office, the same day as your appointment. CEREC means no conventional impressions, No temporaries, No long waiting periods, metal-free, highly aesthetic, and long lasting. Treatment is completed in one sitting. “Our mission as your neighborhood dentist is to supply superior dental services in a comfortable environment available to people all over Buffalo and the Western New York area. We deliver the highest level of dental care by combining the most advanced materials, cutting edge technology, and our highly knowledgeable, caring, honest and professional staff. We strive to create lasting relationships with our patients allowing us to tailor treatment to their specific needs. Specialties: Not only do we provide family dentistry and general care in Amherst, NY, we also provide many other dental services including: Conventional Dentures, AvaDent Digital Dentures, Denture Stabilization, Dental Implants, Cosmetic Dentistry, Crowns and Veneers, Dental Extractions, Socket Preservation, Mini-Dental Implants and Tooth Replacement. LĪfdental Adult Compassionate Care. LĪfdental is an innovative approach to an age-old problem: caring for the teeth and oral health of adults. LĪfdental is in business to provide holistic dental and oral health care to meet the critical needs of all adults. Good dental health and oral hygiene must extend beyond the intervention and prevention practices of focusing on the dental quality of children and young adults. Specialties: Pediatric dentistry; care for infants, children, and teenagers; dental care for patients with special needs; treatment under general anesthesia; orthodontics; sedation dentistry; periodontal treatment; cosmetic and implant dentistry; Invisalign; teeth whitening; veneers; dentures; and much more! Fraser Donna J DDS PC – A native of western New York, Dr. Fraser graduated from the university of buffalo School of dental Medicine in 1988. Dr Fraser completed a residency program at Buffalo general hospital in 1989 with an emphasis on geriatrics and oral surgery.From 1989 to 2000 Dr Fraser worked part time servicing local nursing homes, and since 1989 has been practicing Dentistry in the Lancaster NY area.In March of 2009, Dr. Fraser opened a new solo practice featuring state of the technology and equipment.